That’s the mission that drives steel building and metal roofing manufacturer, Metals Direct. 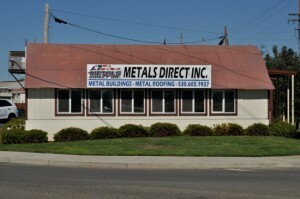 Metals Direct delivers the finest quality product with the best customer service in the metal building industry. Headquartered in Redding, CA, our diverse array of products makes us one of the most comprehensive metal suppliers. We offer only the highest-quality products like Energy-star rated cool roof systems, Stucco-embossed profiles for a more rigid sheet, Divine Tile & Shake Stone Coated Steel Roofing System, just to name a few. Call Metals Direct, Inc at 1-888-285-0598 or email us through our convenient web form. Why use Metals Direct, Inc. as your primary source for custom engineered buildings and Energy-Star Metal Roofing Systems? Our dedicated employees value the trust and respect of their customers. If you are considering a new line of metal products for your store, or purchasing a metal building or metal roofing for your own needs, here are the reasons why you should choose us. Dedication: We are dedicated to providing the best possible services to obtain the best possible result in each situation. Good Communication: We’ll return your phone calls as quickly as possible, usually the same day. We’ll keep you fully informed about what is happening with your order and make sure you have the documents, explanations, and advice you need to understand the installation process and make good decisions for your own situation. Efficiency: We do outstanding work on time and within budget. Outstanding Customer Service: We understand that good customer service centers on treating customers the way we would like to be treated ourselves. For this reason we treat our customers as if our business depended on them – because it does. Excellent References: If you are still undecided, please read what some of our many satisfied clients have to say about their good experience with our services and us.